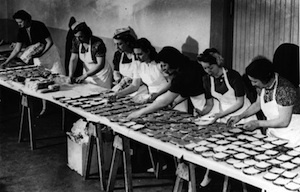 The 50s were a time of great prosperity for America, and it definitely showed in how they cooked. After World War II, new technologies were developed rapidly, and people began to look excitedly to what the future had to hold. "House of the Future" shorts began to pop up everywhere, to promote nascent technologies like plastics, or companies like General Motors. Looking back on what the 50s thought was in store is alternately funny and kinda sad. If we can invent refrigerators with TVs in them, why can't we have cakes that make themselves? Surely the technology exists. 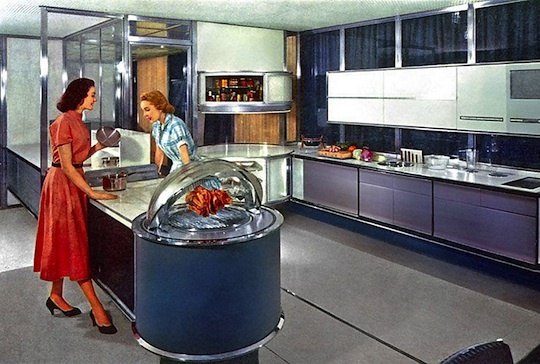 First up are two awesome Kitchen of the Future videos for the price of one. The first minute is a clip from General Motors' promotional movie "Design for Dreaming" featuring dancing, a cake that makes itself and other great futuristic stuff. The second part is a promotional video featuring a futuristic kitchen made of plastics and, instead of a stove, there's a microwave! This next one is a Kitchen of the Future from the UK. Even the future can't please grandma. Part of the Czech Kitchen of the Future consists of the same set that they used in "Design For Dreaming," yet is somehow depressing. This commercial for a futuristic electric stove just makes me wonder what the hell people used to cook food before this. Did they just set a tree on fire in the middle of their living room and roast a pig on a spit over the flame? I'm sure I just gave some hipster a very bad idea. Remembers those Tex Avery "___ of the Future" cartoons that used to play on Cartoon Network during the day? Those were my favorite cartoons, and this House of the Future short is my favorite one of all time. The kitchen part starts around 4:15, but you should watch the whole thing, because it's full of awesomeness and weird, blatant sexism. Who doesn't hate their mothers-in-law, amiright?? Where are my food pills?! I will now require my flying car please.